Each member of the Alaska ALA shares a personal commitment to increasing professionalism of law office administration. Through the resources of the national and local organization, our members are provided opportunities for continuing education, insight into industry trends, analysis of emerging management techniques and a wide array of information designed with one purpose in mind – to assist our members in becoming better support to their member law firms or agencies. We are a Chapter of the Association of Legal Administrators. 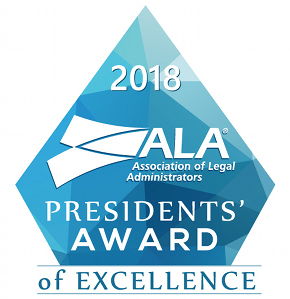 Alaska ALA is an important support network for the legal administrator. The monthly meetings offer members an opportunity to exchange information, network with their peers and learn of important new developments through speaker presentations and round table discussions. Each member of Alaska ALA contributes to the strength of the chapter by adding his/her experience, abilities and interests to those of the other members. The strength of Alaska ALA is each member’s willingness to participate in and further the goals of the organization. Our membership is open to all individuals who manage the legal affairs of their law firm, legal services clinic, corporate legal department, or governmental legal agency. If you would like to join our organization, please see Join Alaska ALA.